In part 1 of this blog series we touched base on the nuts & bolts of what joints are and how several factors can positively & negatively impact their health. We also went over joint stability and joint flexibility and factors that impact both. These are all topics I will glimpse over again soon but for the sake of this post I want to dig deep down into the skeletal level. There are three different types of joints in the human body. Fibrous joints - These joints allow virtually no movement, hence the name Fibrous. You'll find fibrous joints connecting the bones of your skull. These bones are held together by strong, fibrous elastic tissues called sutures. Cartilaginous joints – These joints allow very little movement and are connected by cartilage. 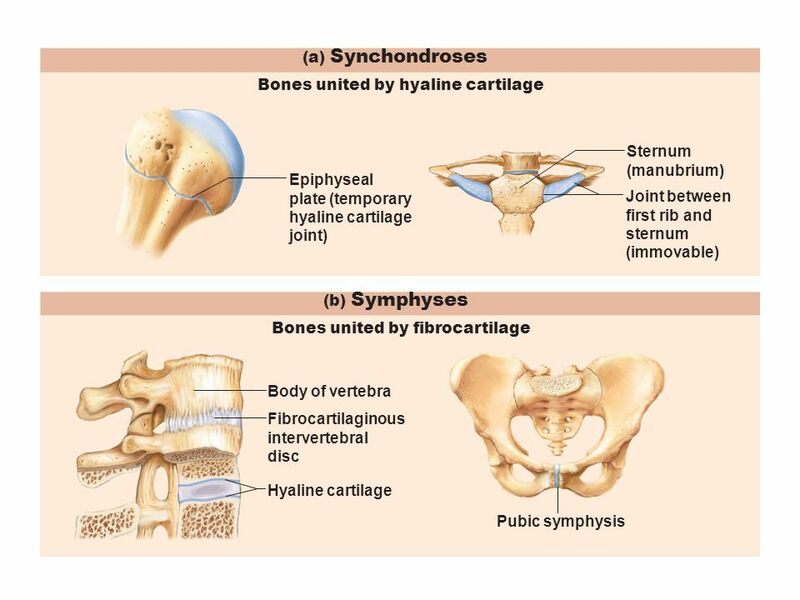 Technically, there are two forms of a cartilaginous joint (Synchondroses or Symphyses). The only difference is the type of cartilage the bones are united by. You will find these joints between vertebral discs of the spine, the pubic symphysis and the joints between your ribs and sternum. *Synovial joints – Synovial joints are of most importance because they posses two major unique features – low friction & large range of motion. Joint (articular) Capsule – Dense, fibrous connective tissue that tightly seals the joint, providing stability. Articular Cartilage – Shock absorbing substance, reduces friction between neighboring bones. Synovial Membrane – Covers inner surfaces & secretes lubricants to allow for fluid movements. Synovial Fluid – Slippery substance allowing for great range of motion. Ligaments – Bands of connective tissue that connect bone-to-bone and work with the joint capsule to prevent extreme / awkward motion. Tendons (not shown) – Tough cords of connective tissue that connects muscle to bones and aids in supporting the joint. Bursa (not shown)– Thin, lubricated cushions located at points of friction between bone and soft tissue (skin, muscle, ligaments, tendons). Technically, muscles are not segments of a joint but it’s important to keep in mind that strong muscles help support and protect our joints. As seen above, synovial joints contain a unique dense, white connective tissue called articular cartilage which provides protective cushioning and lubrication. This cartilage is 1-5mm thick and it covers the ends of our bones. Articular Cartilage serves to spread loads at the joint over a wide area so the stress at any contact point between bones is minimized. Articular cartilage also allows movement of bones at the joint with minimal friction. When joints are under load, articular cartilage deforms and oozes synovial fluid. Motion of one bone end over the other is typically supplemented with a steady flow of synovial fluid. Say for example you were to drop down from an elevated surface (Depth drop). If it weren’t for the articular cartilage, your bones would be highly vulnerable to coming in contact with one another upon landing, causing some pretty serious irritation and high risk of injury. Healthy cartilage can reduce maximum contact stress acting at a joint by 50% or more. During natural growth, articular cartilage at a joint like the knee increases in volume as the child’s height increases, but not as weight increases. This is alarming because according to the Annie. E Casey Foundation, 47% of U.S children do not exercise regularly and 31% of children aged 10-17 are obese. With that being said, all of these children are at risk for joint complications. Children who do participate in vigorous sport activities however accumulate knee cartilage faster than those who do not, and males tend to gain knee cartilage faster than females. That little scientific fact is just another reason why I think participation in sports at a young age is so significant. Outside of the many positive experiences associated with youth sports like sportsmanship, teamwork & all the other life lessons to be learned, physical activity helps develop healthy joints. Hall, Susan J. (2007). Basic Biomechanics fifth edition. New York, NY: McGraw-Hill. Beachle, Thomas R.& Earle, Roger W. (2008). Essentials of Strength Training and Conditioning third edition. Denver, CO: Human Kinetics. Marieb, N. Elaine. (2006). Essentials of Human Anatomy & Physiology eighth edition. San Francisco, CA: Pearson Education, Inc.